Constituents: choline, sugar, mucilage. 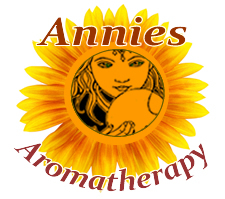 the essential oil contains up to 90 percent anethole. Preparation Methods & Dosage :Sweet and very aromatic, anise can be used in tea, or in baking and cooking, the taste compliments cookies, cakes, and pasta dishes. Aniseed gives the Greek liqueur ouzo it's distinctive licorice taste. Anise essential oil has a sweet, licorice-like aroma that inspires exhilaration, euphoria and elation. Anise oil improve appetites and lift the mood when diffused in the air before dinner. Traditional Chinese Medicine Star anise is found in many traditional Chinese and Japanese recipes for food and medicine. It is used for similar purposes as sweet anise, but is considered to be drying and warming. Anise Seed Side Effects: Narcotic in large doses. Anise seeds contain anethole, a plant hormone similar to human estrogen, that promotes menstruation, and lactation in nursing mothers. Anise should not be used while pregnant and in young babies. The essential oil is for topical use only. An annual herb the likes full sun and fairly rich soil. Grows to a height of 1 to 2 feet tall. Plant when all danger of frost is over. Gather the seeds in the fall when they start to turn brown. 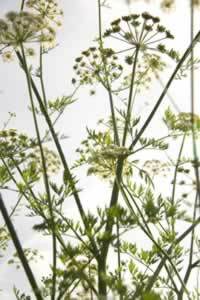 Cut the entire umbel along with a length of stalk, and hang upside down to dry. Related Species Star anise, Illicium verum , is found in many traditional Chinese and Japanese recipes for food and medicine. It is used for similar purposes as sweet anise, but is a different herb altogether. W.T. 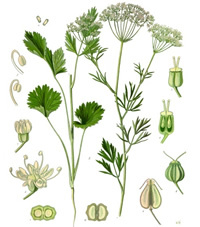 Fernie, M.D.. "Herbal Simples Approved for Modern Uses of Cure",(1897) The herb is a variety of the Burnet Saxifrage, and yields an essential oil of a fine blue colour. To make the essence of Aniseed one part of the oil should be mixed with four parts of spirit of wine. (alcohol) This oil, by its chemical basis, "anethol," represents the medicinal properties of the plant. It has a special influence on the bronchial tubes to encourage expectoration, particularly with children.